Thank you. 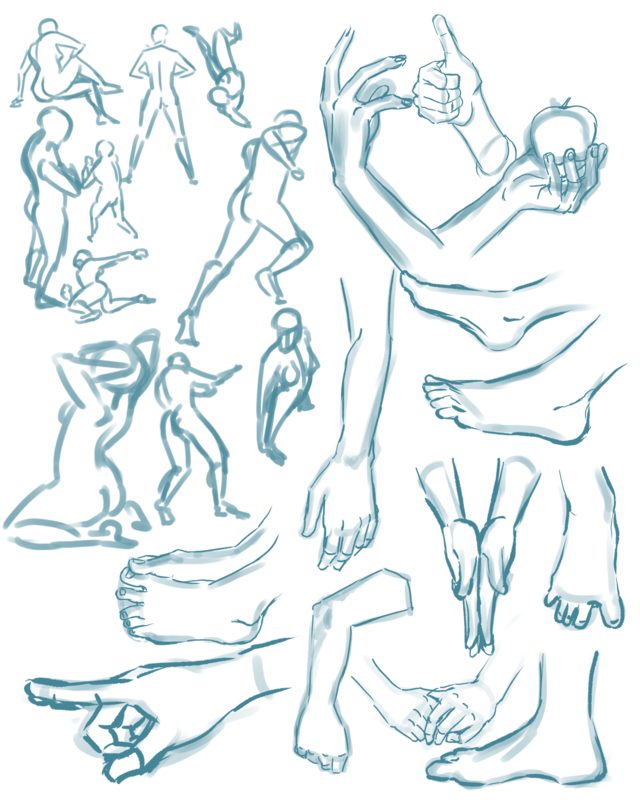 I'm going to do longer studies next time instead of my usual one or two hour sessions. Sorry for the lack of content on this thread. I'm feeling down in the dumps as of late, job wise. Just depression. Have a digital painting art process video that I did for my RP blog. Last edited by Ninja-J : 12-13-2016 at 08:10 PM. I feel your studies and your paintings are two different worlds. Like you've sat down, gone "this is a study to improve!" or "this is a painting for fun". And there doesn't feel to be all that much overlap between the two, which to me is a bit baffling. 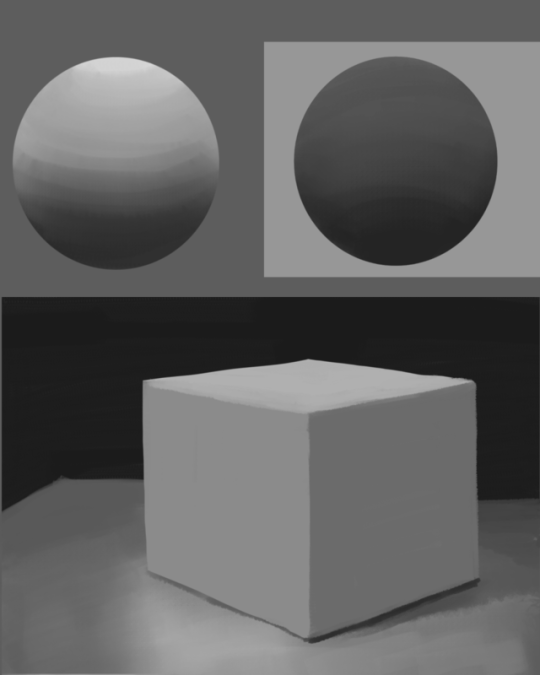 So you've done all these grayscale studies and still life and portrait studies and paint instead of lineart. What's the point of studies if, when you get "serious", you throw that out the window and fall back to the same way you do things before? Like that highlight line on top of the lip and the eyes. It doesn't make too much sense for the eyes, and none at all for the lips, but I see it all the time in your paintings... when it doesn't show up in your studies. Which says to me you've picked up a bunch of bad shortcut habits that you need to break first. I understand. Thank you for your honestly. I'll make more time to put in more studies after work and won't slipped up again. Last edited by Ninja-J : 01-09-2017 at 06:54 PM. I didn't use any blending/blur brushes. 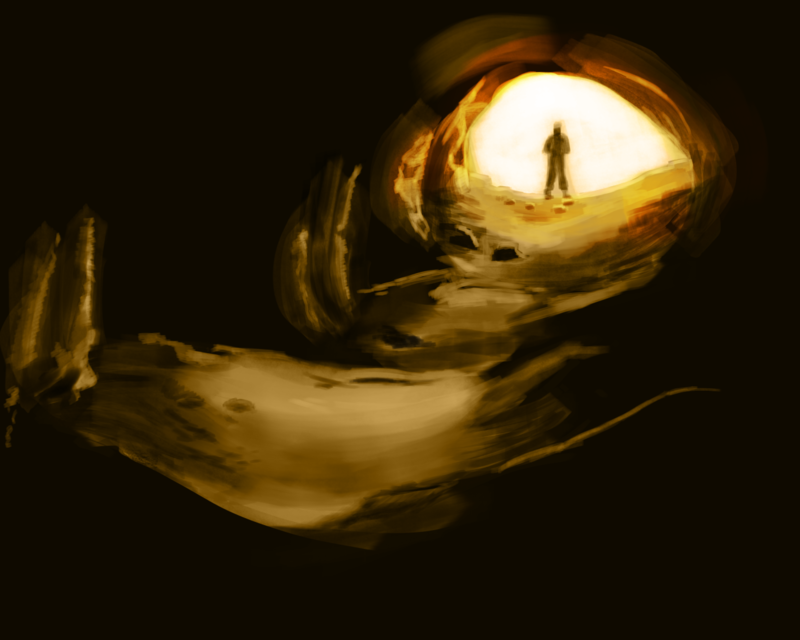 This is strictly done with a block brush and playing around with opacity. 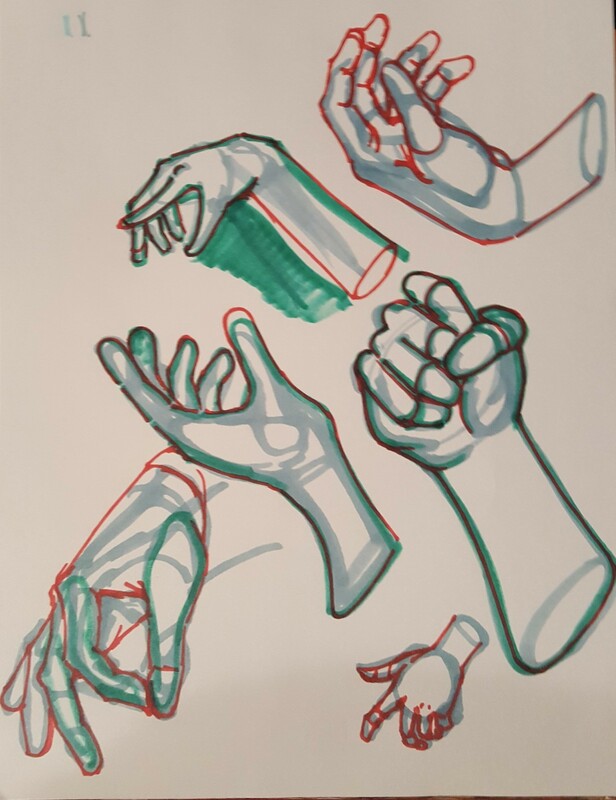 When doing values studies, I've found that it helps to squint to really help group your values. As it stands, the study is very good, but only slightly off to the point that it doesn't read as the model. For example, the shadow on the side of her nose is very subtle in your reference, but very strong in your study. This gives the appearance of a stronger nose, and breaks the likeness. Same with the shadow on the side of her face. In the reference, it's darkest by the cheekbone, and then subtly tapers off at the cheek, yet you've extended it all the way to her jaw. Go ahead and squint at the picture and you'll see what I mean. Overall, though, don't get discouraged. Constant practice is how we all improve! 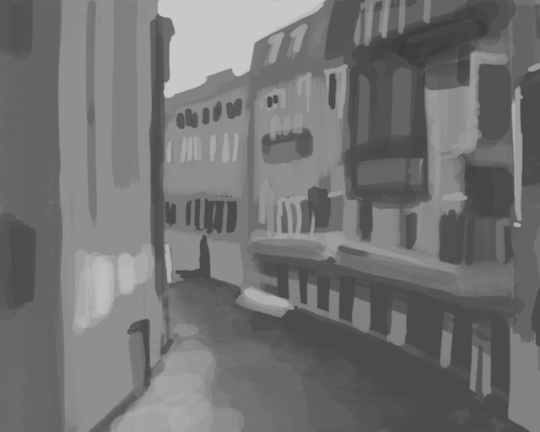 Background studies from greyscale to color. I meant to ask, but do you put in every single detail in the picture or work large to small? No blending or blur brush used. 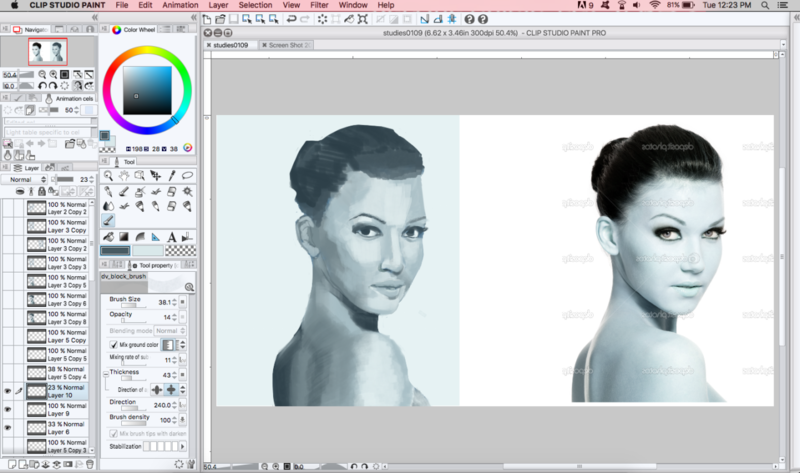 The only brush that I have used is the block brush and playing around with opacity. A pile of gestures/expressions/anatomy/faces studies from January 2017. Last edited by Ninja-J : 04-01-2017 at 09:13 PM. 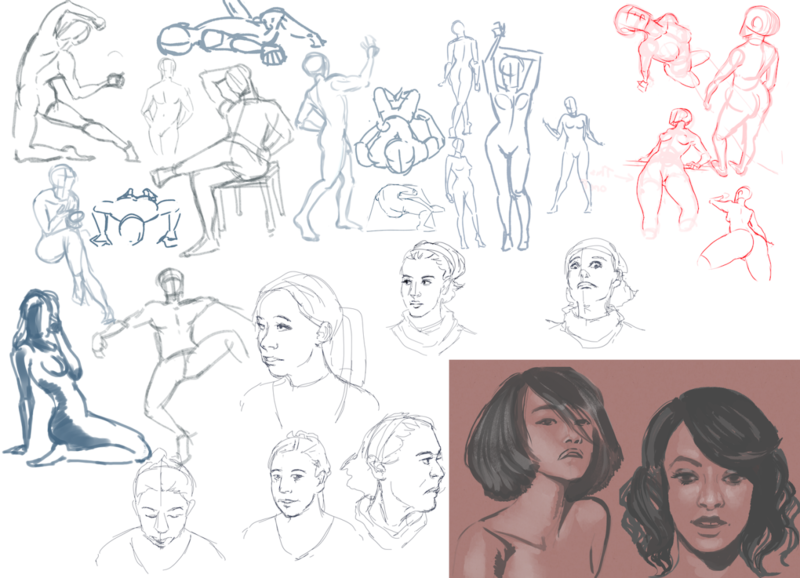 Tonight's warm-up studies. Sorry for the lack of updates, but I'm just busy nowadays. WIP on a study I'm currently doing. I spend an hour and a half on this before getting ready for bed due to my work shift tomorrow. 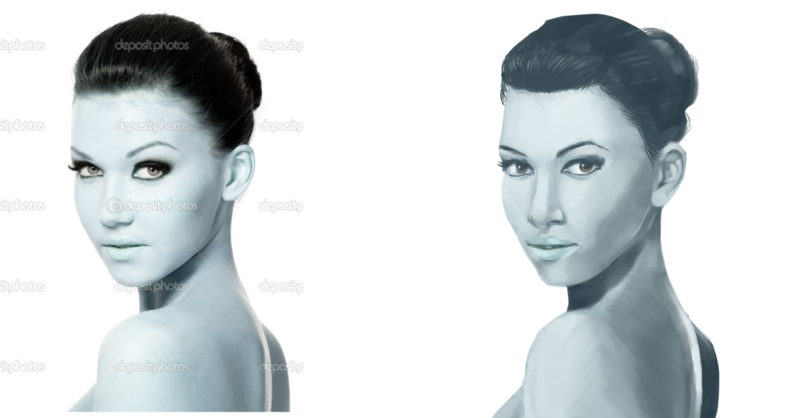 For this, I used a crayon brush and then a low opacity block paint brush for blending in the shading. I'll post the next progress tomorrow. Last edited by Ninja-J : 04-17-2017 at 10:02 PM. Pretty good, but I think you're still reliant on thinking in line and then coloring it in. For example, one buttock is lit from the viewer's perspective, the other is lit from both sides and is shadowed from the viewer. And a few areas like the upper back are more line than value. 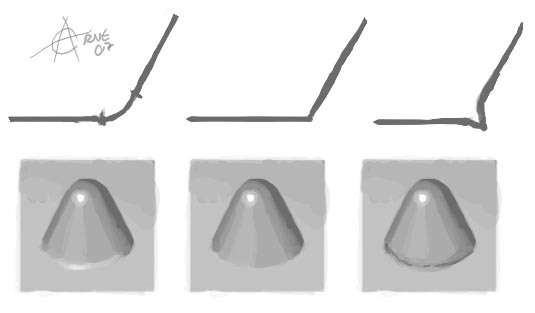 Consider whether every line you see in your painting is a line that actually exists (and is thus a very area of value), or is a line drawn because you need help differentiating your values. Very helpful advice! Thank you for the critique! Next WIP study and it involves with backgrounds this time. I'll update it tomorrow when I'm less tired. Last edited by Ninja-J : 05-10-2017 at 10:09 PM.